Rowans, Whitebeam or Sorbus are deciduous trees which can range from dwarf shrubs to large trees and are generally very hardy. They are primarily grown for their decorative foliage of pinnate leaves and clusters of small pink or white flowers. These are followed in the Winter by beautiful Autumn colours and large bunched berries. These trees are perfect for encouraging wildlife in both small and large gardens as they can be kept potted or planted depending upon your preference. 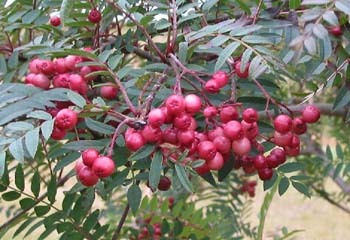 Sorbus are at their happiest when sitting in well-drained fertile soil similar to the mountain slopes they originate from. Full sunlight or dappled shade is also preferable as theses trees do not thrive when left in the shade. The trees may require light pruning in late Winter or early Spring. Simply remove any damaged or diseased shoots, mulch well and feed. This will keep your Rowen in tip top condition. If planting trees staking is often needed, but it should be no higher than 60cm (2ft) above the ground. Tree Staking Advice.